Network programming is complex: one has to deal with a variety of protocols (IP, ICMP, UDP, TCP etc), concurrency, packet loss, host failure, timeouts, the Sockets API for the protocols, and subtle portability issues. The protocols are typically described in RFCs using informal prose and pseudocode to characterise the behaviour of the systems involved. That informality has benefits, but inevitably these descriptions are somewhat ambiguous and incomplete. The protocols are hard to design and implement correctly; testing conformance against the standards is challenging; and understanding the many obscure corner cases and the failure semantics requires considerable expertise. directly usable as a basis for conformance testing, not read-and-forget documents. In this work we have established a practical technique for rigorous protocol specification, in HOL4, that makes this ideal attainable for protocols as complex as TCP. We describe specification idioms that are rich enough to express the subtleties of TCP endpoint behaviour and that scale to the full protocol, all while remaining readable. We also describe novel tools for automated conformance testing between specifications and real-world implementations. To develop the technique, and to demonstrate its feasibility, we have produced a post-hoc specification of existing protocols: a mathematically rigorous and experimentally-validated characterisation of the behaviour of TCP, UDP, and the Sockets API, as implemented in practice, at both protocol and service levels of abstraction. The resulting specifications may be useful in their own right in several ways. They have been extensively annotated to make it usable as a reference for TCP/IP stack implementors and Sockets API users, supplementing the existing informal standards and texts. They can also provide a basis for high-fidelity conformance testing of future implementations, and a basis for design (and conceivably formal proof) of higher-level communication layers. Perhaps more significantly, the work demonstrates that it would be feasible to carry out similar rigorous specification work for new protocols, in a tolerably light-weight style, both at design-time and during standardisation. We believe the increased clarity and precision over informal specifications, and the possibility of automated specification-based testing, would make this very much worthwhile, leading to clearer protocol designs and higher-quality implementations. We discuss some simple ways in which protocols could be designed to make testing computationally straightforward. This github repository contains an updated version of the original protocol-level specification (described in Vol. 1 and 2 below) and revised tools, updated by Hannes Mehnert 2015-2019. (it does not cover the ICNP 06, POPL 09, or ATS 05 papers). Engineering with Logic: HOL Specification and Symbolic-Evaluation Testing for TCP Implementations . Steve Bishop, Matthew Fairbairn, Michael Norrish, Peter Sewell, Michael Smith, Keith Wansbrough. 14pp. Also in pdf. In POPL 2006. Rigorous specification and conformance testing techniques for network protocols, as applied to TCP, UDP, and Sockets. Steve Bishop, Matthew Fairbairn, Michael Norrish, Peter Sewell, Michael Smith, Keith Wansbrough. 12pp. Also in pdf. In SIGCOMM 2005. TCP, UDP, and Sockets: rigorous and experimentally-validated behavioural specification. Volume 1: Overview. Steve Bishop, Matthew Fairbairn, Michael Norrish, Peter Sewell, Michael Smith, Keith Wansbrough. 88pp. Technical Report 624. March 2005. Also in pdf. TCP, UDP, and Sockets: rigorous and experimentally-validated behavioural specification. Volume 2: The Specification. Steve Bishop, Matthew Fairbairn, Michael Norrish, Peter Sewell, Michael Smith, Keith Wansbrough. 386pp. Technical Report 625. March 2005. Also in pdf (with internal hyperlinks) and in ps 2up (good for printing). The TCP Specification: A Quick Introduction. 5pp. February 2005. Steve Bishop, Matthew Fairbairn, Michael Norrish, Peter Sewell, Michael Smith, Keith Wansbrough. Also in pdf. 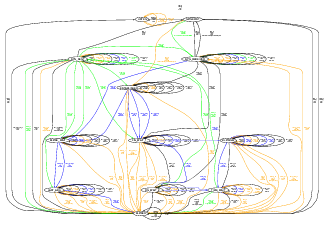 An approximation to the real TCP state diagram. Also in pdf. A rigorous approach to networking: TCP, from implementation to protocol to service . Tom Ridge, Michael Norrish, Peter Sewell. Also in pdf. In FM'08. See also the accompanying specification, Volume 3 below. TCP, UDP, and Sockets: Volume 3: The Service-level Specification. Thomas Ridge, Michael Norrish, Peter Sewell. Technical Report 742. February 2009. Rigorous Protocol Design in Practice: An Optical Packet-Switch MAC in HOL . Adam Biltcliffe, Michael Dales, Sam Jansen, Tom Ridge, Peter Sewell. Also in pdf. In ICNP 2006. The protocol specification: SWIFT MAC Protocol: HOL Specification. Verifying distributed systems: the operational approach. Tom Ridge. In POPL 2009. Stenning's Protocol Implemented in UDP and Verified in Isabelle. Michael Compton. The Australasian Theory Symposium, Jan 2005. Here are papers about our earlier work focussing just on UDP, ICMP, and the Sockets API. The first technical report and TACS paper describe a model without time, threads, or modules, and using informal mathematics. The ESOP paper reports on a HOL specification extended to cover those three aspects. The SIGOPS EW paper is a position paper reflecting on the experience of this and of Norrish's C semantics work. The UDP Calculus: Rigorous Semantics for Real Networking. Technical report 515. Andrei Serjantov, Peter Sewell, and Keith Wansbrough. iv+70pp. July 2001. Also in ps.gz and pdf. The UDP Calculus: Rigorous Semantics for Real Networking. Andrei Serjantov, Peter Sewell, and Keith Wansbrough. In TACS 2001, LNCS 2215, 535-559. Also in ps.gz. Timing UDP: mechanized semantics for sockets, threads and failures. Keith Wansbrough, Michael Norrish, Peter Sewell, Andrei Serjantov. In ESOP 2002, LNCS 2305, 278-294. Also in ps.gz and pdf. Timing UDP: the HOL model. Here are the HOL scripts and a typeset version of the timed host semantics described in the paper above. Rigour is good for you and feasible: reflections on formal treatments of C and UDP sockets. Michael Norrish, Peter Sewell, Keith Wansbrough. In SIGOPS EW 2002, 49-53. Also in ps.gz. Flow Control in the Linux Network Stack. Note. Michael Smith, Steve Bishop. Also in pdf. This work has been funded by the EPSRC REMS Programme Grant EP/K008528/1, an EPSRC Leadership Fellowship and a Royal Society University Research Fellowship (Sewell), a St Catharine's College Heller Research Fellowship (Wansbrough), EPSRC grant GR/N24872 Wide-area programming: Language, Semantics and Infrastructure Design, EPSRC grant EP/C510712 NETSEM: Rigorous Semantics for Real Systems, EC FET-GC project IST-2001-33234 PEPITO Peer-to-Peer Computing: Implementation and Theory, CMI UROP internship support (Smith), and EC Thematic Network IST-2001-38957 APPSEM 2. National ICT Australia is funded by the Australian Government's Backing Australia's Ability initiative, in part through the Australian Research Council.